The Daily Mail editor cuts shares out of his diet, but will he get a more voluptuous pay packet? 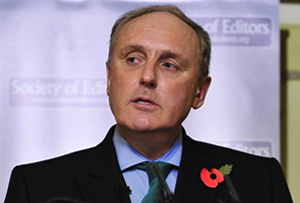 Daily Mail editor Paul Dacre has sold his remaining shares in the tabloid’s parent company Daily Mail & General Trust, pocketing £347,564 for the 37,861 shares. The best-paid editor on Fleet Street, who took home almost £1.8m in 2012, sold his shares after they soared 72.5% in the last 12 months. With the Mail doing rather well compared with the rest of the flailing newspaper industry, Dacre’s decision raises the question of what is next for the tabloid king. Dacre sold his shares on 28 November, although it was only reported yesterday in a company filing, exactly a week after DMGT reported yearly adjusted pretax profit had climbed 10% to £282m for the year ending September 30. The sidebar of shame continued to out-troll itself, with Mail Online’s revenues soaring 48% to £41m. Why sell shares now then, when there are still more flaunted curves to be poured into figure-hugging dresses? Perhaps DMGT chairman Viscount Rothermere, who sold £948,000 worth of shares on 27 November, gave us a clue when he said in an October interview with Tatler that Dacre had agreed to a new contract. That was just after the controversy over the Daily Mail’s hatchet job on Ed Miliband’s father had started bursting blood vessels all over liberal Britain. The new deal replaces a 2011 agreement, where Dacre was paid an additional £500,000 for each year he worked until his 65th birthday, which he celebrated on November 14. Happy birthday Paul?